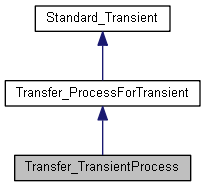 Adds specific features to the generic definition : TransientProcess is intended to work from an InterfaceModel to a set of application objects. Sets TransientProcess at initial state, with an initial size. Specific number of a starting object for check-list : Number in model. Returns the Context attached to a name, if set and if it is Kind of the type, else a Null Handle Returns True if OK, False if no Context. Tells if an entity fails on data checking (load time, syntactic, or semantic check). Normally, should answer False. It is not prudent to try transferring an entity which fails on data checking. Tells if an entity is well loaded from file (even if its data fail on checking, they are present). Mostly often, answers True. Else, there was a syntactic error in the file. A non-loaded entity MAY NOT BE transferred, unless its Report (in the model) is interpreted. Returns the Model used for StartTrace. Sets a Context : according to receiving appli, to be interpreted by the Actor. Sets a Graph : superseedes SetModel if already done. Sets an InterfaceModel, used by StartTrace, CheckList, queries on Integrity, to give informations significant for each norm. Returns the list of sharings entities, AT ANY LEVEL, which are kind of a given type. Calls TypedSharings from Graph Returns an empty list if the Graph has not been aknowledged.